The Willys MB and the Ford GPW made up the bulk of WW2 production in “jeeps”. We usually think of WW2 jeeps as olive drab vehicles and pretty much nothing else. But the US Army did camouflage some of their jeeps. The allies, such as the English, practiced this as well. Side view of the US WW2 camo pattern. FM 5-21, Camouflage Painting of Vehicles and Equipment, October 7, 1942, provides us with a glimpse of the various patterns available for use depending on location and time of year. 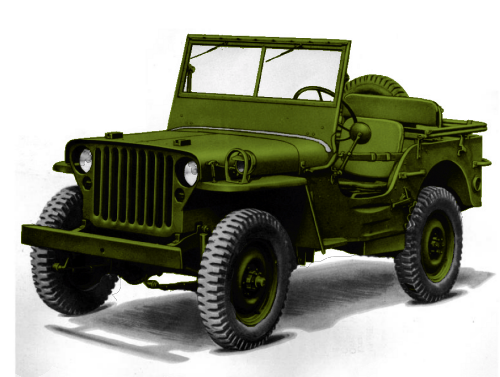 A variety of vehicles have drawings that illustrate the “correct” pattern to use but we are mainly interested in the WW2 jeep on http://www.42FordGPW.com.